Ramen has two faces. One is the college dorm food of a whole generation of people under 50; the other, an esoteric ritual of noodle basket shaking, mysteriously simmering broths, heady seasonings and exotic toppings often accompanied by loud music, unpronounceable beer and way too many tattoos. At its core, however, it’s not tremendously different than chicken noodle soup, which is perhaps what makes it so appealing: the familiar clothed in the exotic. If you’ve made stocks before, you can make ramen. If you’ve made pasta before, you can make ramen noodles, pure and simple. If you haven’t done either of those, start now—it’ll be great. One explanation for ramen’s relative familiarity is its trajectory through history. Its signature noodle style was brought to Japan by Chinese immigrants who developed noodles that were slightly alkaline. This allowed them to last a bit longer in the climate of southern China, but it also gave them that characteristic bounce. As ramen moved through the 20th century, American postwar occupation (where wheat imported for noodles was used to lure those suffering from food shortages away from the communist party) and eventually the development of instant ramen in 1958, there emerged a Japanese version of the original Chinese dish. Now a dietary staple of college students across North America, traditional handmade ramen has seen a serious rise in popularity, thanks to chefs like David Chang, Ivan Orkin and chains like Totto ramen (which started in New York, and now boasts local outposts in both Allston and Somerville). If you prefer a ramen business based closer to home, Yume Wo Katare offers an excellent bowl in Porter Square, but I implore you to try your hand at homemade ramen in your own kitchen. Below are the steps to make a few different broths: a chicken and pork broth, a traditional dashi (which includes dried fish) and a vegetarian version. A recipe for shoyu—or soy sauce—tare is provided (it’s the flavoring and seasoning of the finished bowl), as are some recommendations for garnish. If you make just one of these recipes by hand, however, my hope is that you try out the noodle. It’s rare to find handmade ramen noodles in restaurants, and as with Italian pasta, the handmade stuff really is the best. Using a digital scale and weighing your ingredients will make a precise dough; measurements in cups and ounces are included in case you don’t have one. Ramen noodles, being slightly alkaline, require a step not found in other styles. To make your own, spread a cup of baking soda onto a sheet pan and shake it to spread it out evenly. Bake it at 300°F for 1 hour. This process changes the soda from sodium bicarbonate to sodium carbonate, a necessary ingredient in alkaline noodles. Once cooled, measure out 5 grams (1 teaspoon) for the dough and store the rest for future use. Whisk the dry ingredients together and gradually incorporate the water. This will take a lot more effort than Italian doughs to come together, so persevere. Add more water 1 tablespoon at a time if the dough seems really dry. Knead in the bowl until a shaggy mess of a ball forms; this could take up to 20 minutes. You could alternatively use a standing mixer to reduce effort. Wrap in plastic wrap and allow to hydrate for 30 minutes. Divide the dough in two, keeping half wrapped in plastic while you roll the first half. Roll the dough out first with a rolling pin and then pass it through a pasta machine on the widest setting. Fold the dough over itself a few times until you have a uniform sheet of dough. If the dough is on the sticky side, dust liberally with cornstarch. Continue to roll down through the settings until you reach the second-to-last thinness. Repeat with the other half of the dough. Divide the finished sheets into the lengths you prefer, and cut them into noodles on the finest setting you have, or do the best you can by hand. Dusting with cornstarch helps to keep them from sticking. The good news is that as hard as this is to work as a dough, once the noodles are cut, they’re very easy to move and store. They seem to beg to be piled up into single serving-sized mounds on a parchment-lined sheet tray. Cover the tray with plastic wrap and refrigerate until needed. When it’s time to cook the noodles and assemble the ramen bowl, bring a large pot of salted water to a boil. Drop one pre-portioned mound of noodles per bowl into the boiling water and cook 3–4 minutes or until al dente. Store any extra uncooked noodles in zip-top bags in the freezer—boil directly from frozen. This recipe contains enough collagen to give a texture similar to aspic when refrigerated. You want a rich, clear stock for this bowl, as it is the foundation of your ramen. After it is made, excess can be stored frozen for future use, even non-ramen uses. When sourcing ingredients for the stock, find a butcher shop as they are more likely to have the odds-and-ends parts you’ll need. The dashi can be made a day or two ahead of time, but really is best fresh. Kombu and bonito flakes aren’t all that obscure and can be found at health food stores and at some supermarkets; dried sardines may be a little more obscure but H-Mart carries them, as will other Asian specialty stores. Any other dried fish will work, such as squid and scallops. A combination of all these is very tasty. Blanch the feet by placing them in enough cold water to cover and bringing it up to a hard boil. Boil for about 5 minutes, then drain through a colander in the sink. Rinse the feet under cold running water to remove the foam that rose to the surface. Place the chicken bones and wings into a clean stockpot along with the blanched feet. Add enough water to cover, and bring to a gentle simmer. Hold the gentle simmer for 6 hours, periodically skimming the surface to remove suds and scum that rise to the surface. Drain the stock through a sieve into another pot. Use a wider colander first to remove the bones, and then strain again through a fine-mesh sieve lined with cheesecloth. Allow to cool in the refrigerator overnight. The next day remove all of the fat and scum that will have solidified on the surface and reserve the fat—you will use some in the final bowl of ramen (any extra fat can be used in biscuits, pie crust, to roast potatoes or other root vegetables). Freeze any remaining broth after the ramen-making process. For a vegetarian version of this broth, replace the fish with a handful of dried mushrooms and a tablespoon of miso. Soak the sardines in cold water for 2 hours. Drain. Place the soaked sardines and kombu into a pot with the water, and heat until it is hot and steaming but nowhere near simmering. Add the bonito flakes and allow them to hydrate for 5 minutes. Strain through a fine-mesh sieve lined with cheesecloth. The better the quality of these ingredients, the better the tare. This is the real seasoning workhorse in this ramen, providing much of the salinity you’d usually get by adding salt to your broth. Bring the mirin and sake to a simmer and burn off the alcohol for 5 minutes. Add the soy sauce and kombu and keep warm for another 5 minutes. This tare can be a made a week in advance. There are myriad garnishes for ramen, and not enough room here to explore marinated eggs or chashu (marinated pork belly). Essential for me is a crisp, fresh, crunch that balances out the fat of the ramen and brightens up the dish. I would suggest a few options to make your bowl a little more relevant to what’s in season in New England, like shaved black radish, watermelon radish, scarlet turnips or kohlrabi in autumn; pea greens and spinach in summer. 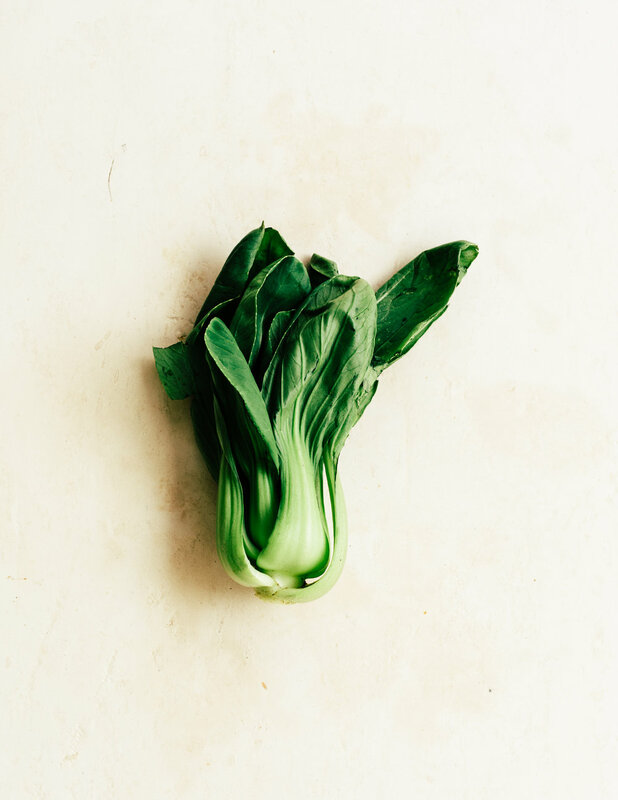 Cold-weather greens available at the market like bok choy are also perfect, as are scallions and cilantro. For the classic soft-boiled egg component, use free-range eggs; the orange yolk will be stunning against the backdrop of the soup. To build a bowl of ramen you begin at the bottom. Into each bowl place one tablespoon of pork fat. Ladle over that one portion of cooked, drained noodles. 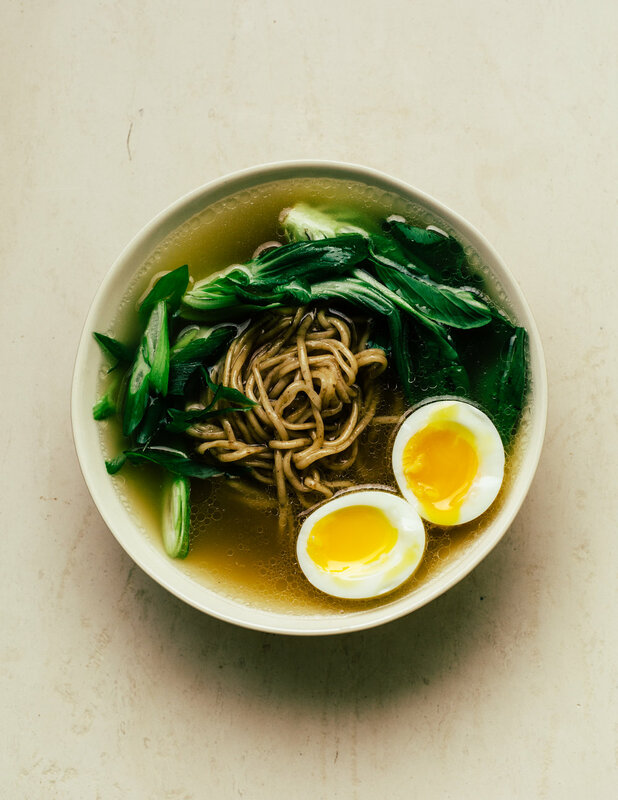 Over the noodles pour in equal parts broth and dashi, about 1–1½ cups total, more if your bowl is bigger! Then mix in two tablespoons of tare, top with your chosen garnishes and serve.